These smooth G40 LED replacement bulbs give your patio/event lighting an instant glow by creating an illuminating distinguished look. 9 times more energy efficient than incandescent bulbs, makes lighting up your celebrations or event easy on the budget! The bulbs are packed in quantities of 25 making them an economical choice. CSA listed, CE certified, and UL listed for indoor and outdoor use. 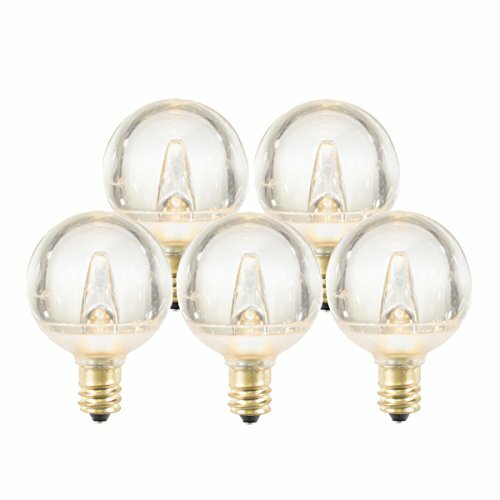 Create that warm feeling when you paint your home or office with a lighting design featuring these bulbs. NEW AND IMPROVED BRIGHTER LED'S. Our new SMD energy efficient LED bulbs have 2 radiant LED's for a beautiful vivid look that compares to the old incadescent lights. Plus each bulb has a 60,000 hour bulb life. All bulbs fit into any C7/E12 light socket. DURABLE WEATHER RESISTANT PLASTIC. These bulbs are made of a high quality weather resistant, durable plastic that prevents rust, corrosion, and breaks. DIMMABLE. Great choice for creating spectacular light shows. REDUCE POWER CONSUMPTION BY MORE THAN 90%! Energy savings and eco friendly - Reduce power consumption by more than 90% compared to incandescent bulbs. UL & CSA APPROVED. All bulbs meet and exceed U.S. industry standards.